Please join us to taste the epitome of CLASSIC BORDEAUX French wines, powerful, fruity and elegantly oaked, the modern equivalent of the great wines of the 18th century, those that Thomas Barton might have enjoyed and chosen himself. 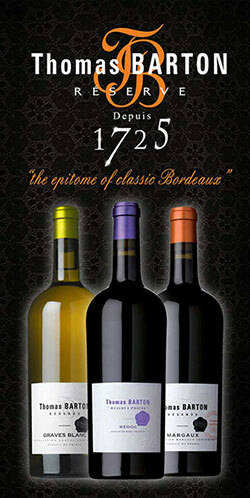 This range of wines is the ultimate homage to Thomas Barton, who traveled to Bordeaux from Ireland in 1725. He quickly became the most important wine merchant in Bordeaux having built a solid reputation among prestigious customers all over Europe. 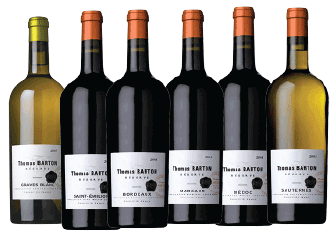 The spirit of Thomas Barton has been perpetuated in this unique and prestigious range of carefully selected wines from the heart of the Bordeaux region’s greatest appellations. These wines are the epitome of classic Bordeaux; rich, fruity and elegantly oaked, the modern equivalent of the great wines of the 18th century, those that Thomas Barton might have enjoyed and chosen himself. Everything starts out in a the vineyard, with a drastic selection of the best terroirs and strict vine-growing rules in order to guarantee high quality fruit. Yields are low, sorting rigorous, and the wines are traditionally fermented before aging in oak barrels to enhance each terroir’s authenticity. The Renaissance of Bordeaux Wines: All these efforts and attention are richly rewarded by the quality and generosity of Thomas Barton Réserve wines, whose powerful, opulent style and excellent aging potential represent the quintessence of the finest wines of Bordeaux. A Renewed Elegance: The Thomas Barton range’s packaging also reflects the founder’s personality and his times: a heavy 18th century-style Bordeaux bottle with a short colored capsule. 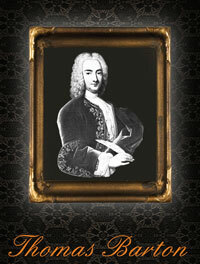 The label combines the sobriety of Thomas Barton’s character and the unique, classic elegance of the 18th century. Our national tasting event in January will sell out fast! This entry was posted in Winery Spotlight Tastings and tagged bordeaux, bordeaux wines, classic bordeaux, french wines, local wine event, tasting, tasting event, thomas barton, wine, wine tasting, winestyles. Bookmark the permalink.